When I graduated from college almost six years ago, the first thing I purchased was an ice cream maker… I mean why not, when you are going out into the world, newly educated and with really no clue about what your future holds, of course all you want/ need in life is an ice cream maker… Sadly in that six years, I think I can count on one had the number of times I have actually made ice cream. That first year I tried a pear avocado sorbet… which was pretty delicious, and the next year I made a strawberry and black pepper sorbet. Also great. 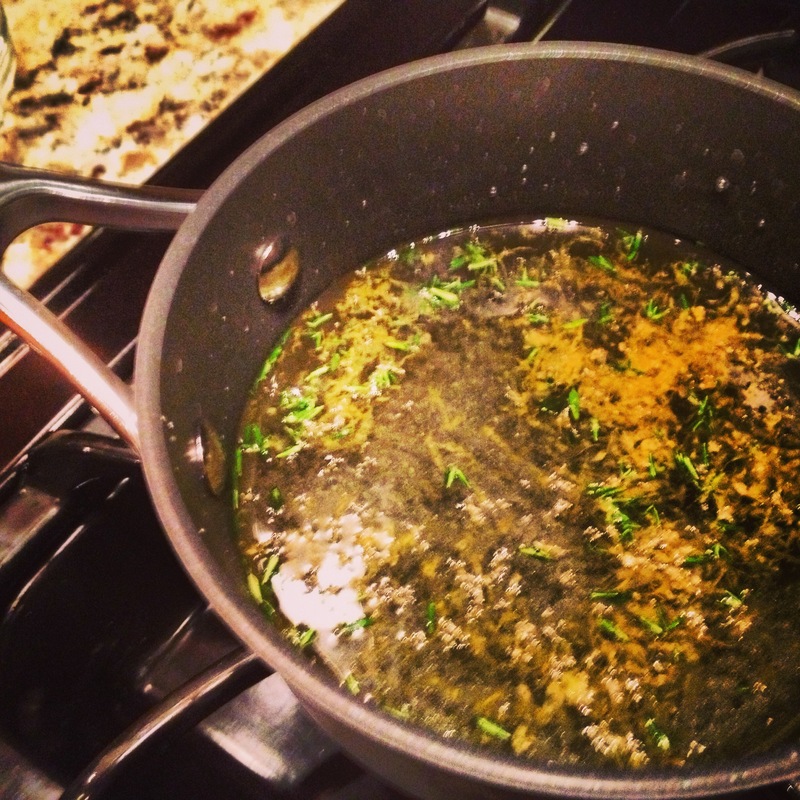 I went on an olive oil ice cream kick a few years later, and made a few batches here and there, and this summer I use some of my fresh picked Marion Berries for a batch of ice cream. At least all of my attempts have been successful, and delicious, even if they have been few and far between (and let’s face it, its probably for the best that I’m not making ice cream every week). This summer I was reminded that the ice cream maker isn’t just for ice cream, and I had a lot of fun making blended mixed drinks. Rum and diet coke, vodka lemonade etc etc… super delicious spin on the adult beverage. 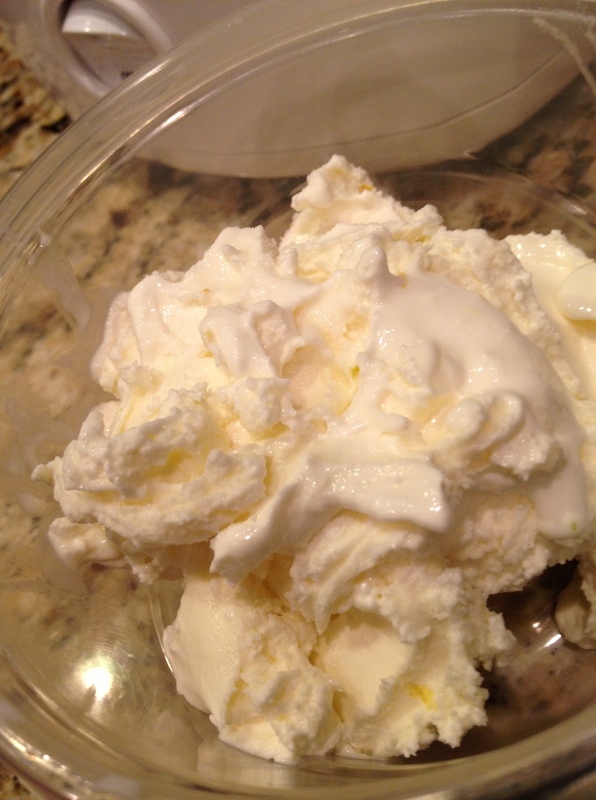 Tonight I decided to make gelato… and it is good. Damn good…. I’m not really sure what possessed me to make gelato on the 1st day of February… its not exactly the most seasonal of desserts, but I stumbled across the recipe about a month ago, and its been lingering in the”I should make that sometime” part of my brain. A couple of friends and I have started a dinner group under the premise that each month one of us has to make a dish we’ve never made before. Of course we are all busy people, and so we have an understanding that some months it might very well be ” I was too tired to make something new, but I will take you all to the taco truck down the street, and we can all order something we’ve never ordered before.” Tomorrow night is our first gathering, I volunteered to host, since unemployment has granted me a bit of free time, and also my parents are out of town for the weekend, so they have donated their kitchen (and their hot tub) to the cause. God bless supportive parents who live a mile and a half away… Anyway, I’m going to be making a sausage/apple/pear dish I read about a few weeks ago on The Splendid Table, but I also remembered how delightful that gelato sounded, so I went back through my mental files, and pulled out the the recipe. One thing I love about making ice cream/ gelato is that it is crazy, stupid easy, and almost always delicious. I had no doubt this recipe would be amazing, I mean really anything with two cups of mascarpone cheese can’t be bad, right? 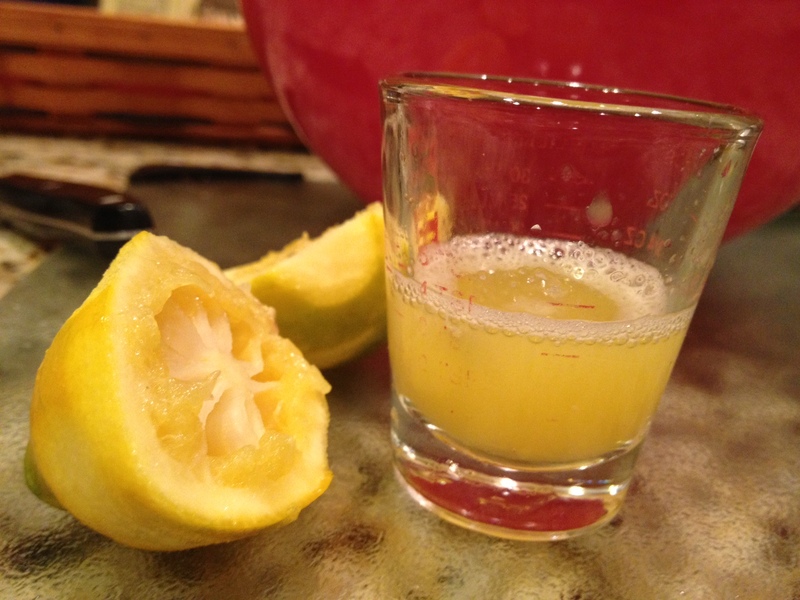 I was also excited because the Meyer lemons growing on my back patio were very nearly ripe, so I decided to add a little bit of flair to the recipe. On a side note, this is the third Meyer Lemon tree I’ve attempted to grow. The first one, Liz Lemon, lived happily in my loft apartment, and I had at least 20 lemons… I made lemon curd… lots of lemon curd. It. Was. Epic. Until she got spider mites… things quickly went down hill after that.I got Liz Lemon Jr. a year later, and things went well until the winter happened, and I didn’t feel like bringing the tree inside and outside all the time, so I made an attempt to wrap it in towels to protect it from the freezing weather… It didn’t work… Technically the tree is still alive, but it aborted all the fruit and I’m pretty sure it has reverted back to the dragon tree it was grafted onto… The tree itself is thriving… but I’m 99.9% sure it is no longer a lemon tree… at the very least, it hasn’t bloomed or produced fruit in a good long while. Perhaps the third time is the charm, at least that is what I’m telling myself with the little lemon tree I fondly call Simon. I figured it was time to try again since I actually have a covered porch that stays relatively warm, and a garage with a south facing window… which is ideal for those few days every winter when you actually need to bring the lemon trees inside. So far so good! 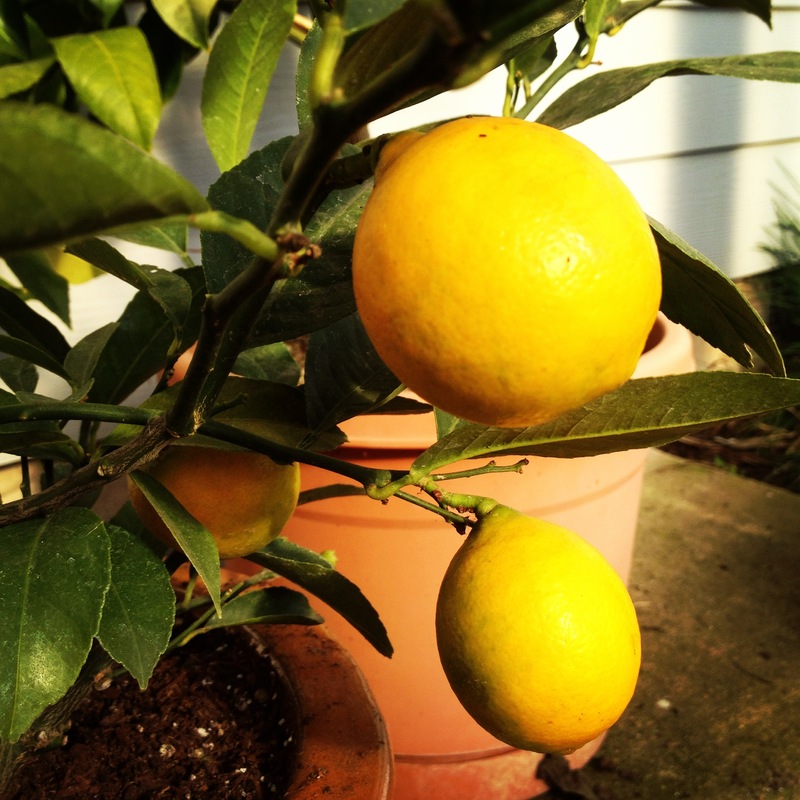 And I picked a lovely looking lemon this afternoon to put into my gelato. 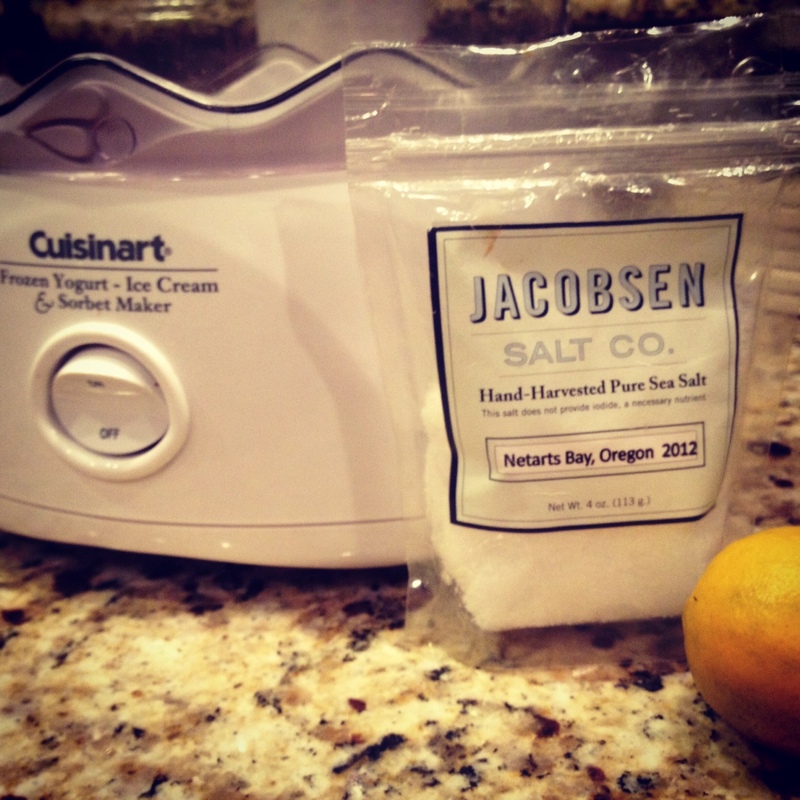 The recipe also called for kosher salt, but I used Jacobsen Sea Salt… a local favorite. 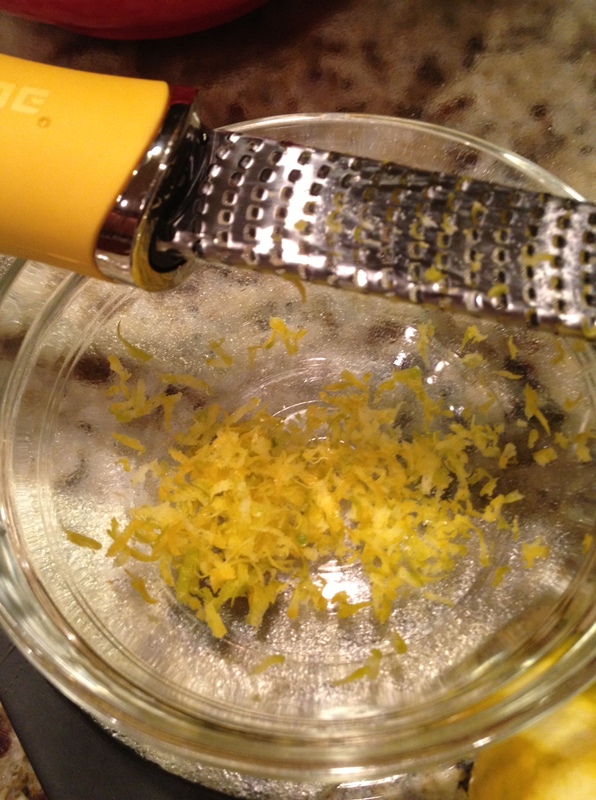 To add a little pizazz to the final dish I candied some additional lemon zest along with some English Thyme to add to the top, along with some crushed pistachios…. Sweet Jesus… it is good. Really Really good. The mascarpone adds this amazing creaminess to it, and I must say, the lemon is just the right amount, not overpowering or underwhelming. Sitting is the new Smoking? I guess it’s time to wiggle around. 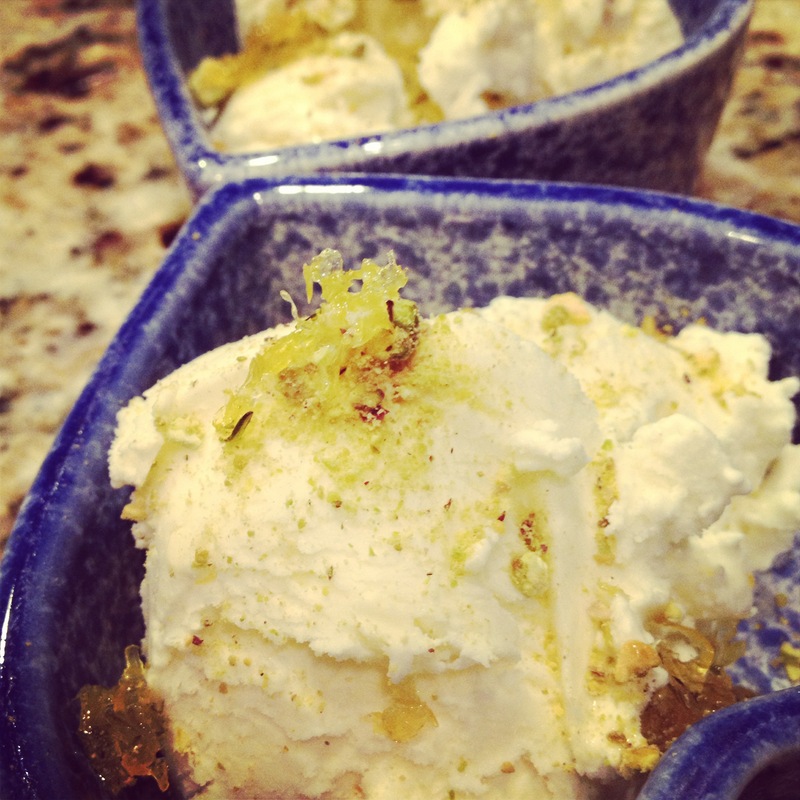 Folks, this gelato is amazing (and that’s coming from a guy that isn’t that into desserts.) Dessert for me is usually a whiskey, neat. 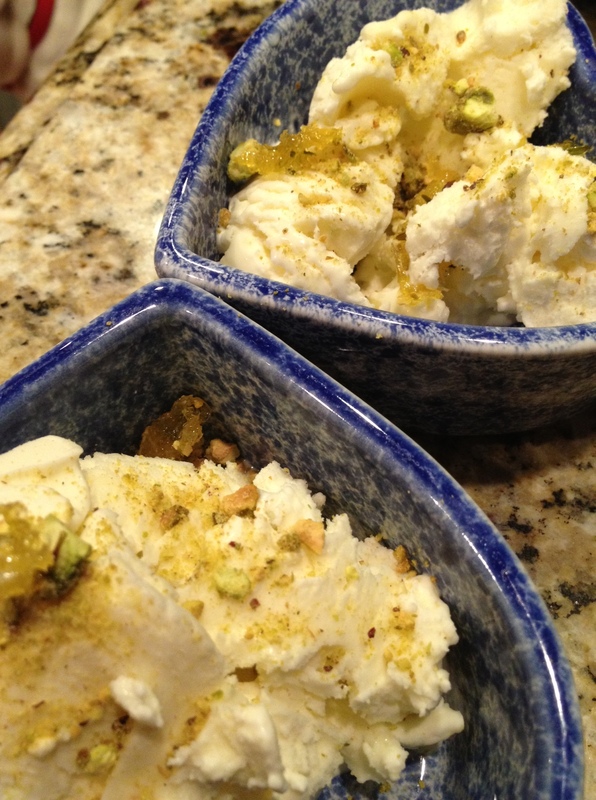 Tonight, however, Tayler (aka, awkward olive) served us this creamy, slightly sweet/almost savory gelato (especially if you add the thyme…do it! 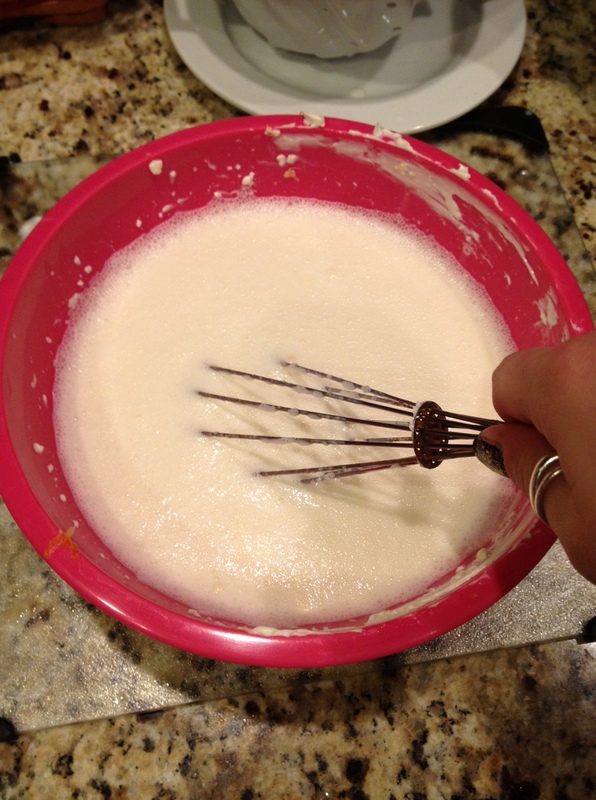 ), with some home-made lemon madeleines and sugar cookies, and…great company!